Following 9/11, President Bush and seven top officials of his administration waged a carefully orchestrated campaign of misinformation about the threat posed by Saddam Hussein's Iraq. It is now beyond dispute that Iraq did not possess any weapons of mass destruction or have meaningful ties to Al Qaeda. This was the conclusion of numerous bipartisan government investigations, including those by the Senate Select Committee on Intelligence (2004 and 2006), the 9/11 Commission, and the multinational Iraq Survey Group, whose "Duelfer Report" established that Saddam Hussein had terminated Iraq's nuclear program in 1991 and made little effort to restart it. President Bush, for example, made 232 false statements about weapons of mass destruction in Iraq and another 28 false statements about Iraq's links to Al Qaeda. Secretary of State Powell had the second-highest total in the two-year period, with 244 false statements about weapons of mass destruction in Iraq and 10 about Iraq's links to Al Qaeda. Rumsfeld and Fleischer each made 109 false statements, followed by Wolfowitz (with 85), Rice (with 56), Cheney (with 48), and McClellan (with 14). The massive database at the heart of this project juxtaposes what President Bush and these seven top officials were saying for public consumption against what was known, or should have been known, on a day-to-day basis. This fully searchable database includes the public statements, drawn from both primary sources (such as official transcripts) and secondary sources (chiefly major news organizations) over the two years beginning on September 11, 2001. It also interlaces relevant information from more than 25 government reports, books, articles, speeches, and interviews. In the closing days of September 2002, with a congressional vote fast approaching on authorizing the use of military force in Iraq, Bush told the nation in his weekly radio address: "The Iraqi regime possesses biological and chemical weapons, is rebuilding the facilities to make more and, according to the British government, could launch a biological or chemical attack in as little as 45 minutes after the order is given. . . . This regime is seeking a nuclear bomb, and with fissile material could build one within a year." A few days later, similar findings were also included in a much-hurried National Intelligence Estimate on Iraq's weapons of mass destruction � an analysis that hadn't been done in years, as the intelligence community had deemed it unnecessary and the White House hadn't requested it. In July 2002, Rumsfeld had a one-word answer for reporters who asked whether Iraq had relationships with Al Qaeda terrorists: "Sure." In fact, an assessment issued that same month by the Defense Intelligence Agency (and confirmed weeks later by CIA Director Tenet) found an absence of "compelling evidence demonstrating direct cooperation between the government of Iraq and Al Qaeda." What's more, an earlier DIA assessment said that "the nature of the regime's relationship with Al Qaeda is unclear." On May 29, 2003, in an interview with Polish TV, President Bush declared: "We found the weapons of mass destruction. We found biological laboratories." But as journalist Bob Woodward reported in State of Denial, days earlier a team of civilian experts dispatched to examine the two mobile labs found in Iraq had concluded in a field report that the labs were not for biological weapons. The team's final report, completed the following month, concluded that the labs had probably been used to manufacture hydrogen for weather balloons. On January 28, 2003, in his annual State of the Union address, Bush asserted: "The British government has learned that Saddam Hussein recently sought significant quantities of uranium from Africa. Our intelligence sources tell us that he has attempted to purchase high-strength aluminum tubes suitable for nuclear weapons production." Two weeks earlier, an analyst with the State Department's Bureau of Intelligence and Research sent an email to colleagues in the intelligence community laying out why he believed the uranium-purchase agreement "probably is a hoax." On February 5, 2003, in an address to the United Nations Security Council, Powell said: "What we're giving you are facts and conclusions based on solid intelligence. I will cite some examples, and these are from human sources." As it turned out, however, two of the main human sources to which Powell referred had provided false information. One was an Iraqi con artist, code-named "Curveball," whom American intelligence officials were dubious about and in fact had never even spoken to. The other was an Al Qaeda detainee, Ibn al-Sheikh al-Libi, who had reportedly been sent to Eqypt by the CIA and tortured and who later recanted the information he had provided. Libi told the CIA in January 2004 that he had "decided he would fabricate any information interrogators wanted in order to gain better treatment and avoid being handed over to [a foreign government]." The false statements dramatically increased in August 2002, with congressional consideration of a war resolution, then escalated through the mid-term elections and spiked even higher from January 2003 to the eve of the invasion. It was during those critical weeks in early 2003 that the president delivered his State of the Union address and Powell delivered his memorable U.N. presentation. For all 935 false statements, including when and where they occurred, go to the search page for this project; the methodology used for this analysis is explained here. In addition to their patently false pronouncements, Bush and these seven top officials also made hundreds of other statements in the two years after 9/11 in which they implied that Iraq had weapons of mass destruction or links to Al Qaeda. Other administration higher-ups, joined by Pentagon officials and Republican leaders in Congress, also routinely sounded false war alarms in the Washington echo chamber. The cumulative effect of these false statements � amplified by thousands of news stories and broadcasts � was massive, with the media coverage creating an almost impenetrable din for several critical months in the run-up to war. Some journalists � indeed, even some entire news organizations � have since acknowledged that their coverage during those prewar months was far too deferential and uncritical. These mea culpas notwithstanding, much of the wall-to-wall media coverage provided additional, "independent" validation of the Bush administration's false statements about Iraq. The "ground truth" of the Iraq war itself eventually forced the president to backpedal, albeit grudgingly. In a 2004 appearance on NBC's Meet the Press, for example, Bush acknowledged that no weapons of mass destruction had been found in Iraq. And on December 18, 2005, with his approval ratings on the decline, Bush told the nation in a Sunday-night address from the Oval Office: "It is true that Saddam Hussein had a history of pursuing and using weapons of mass destruction. It is true that he systematically concealed those programs, and blocked the work of U.N. weapons inspectors. 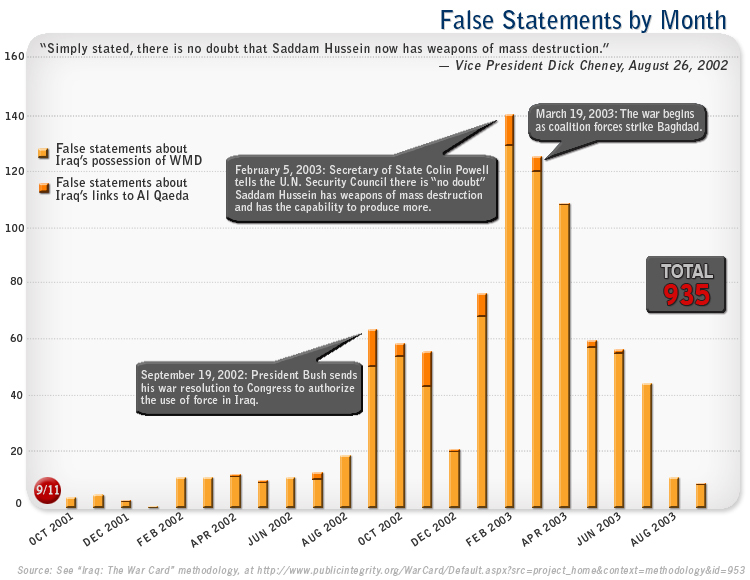 It is true that many nations believed that Saddam had weapons of mass destruction. But much of the intelligence turned out to be wrong. As your president, I am responsible for the decision to go into Iraq. Yet it was right to remove Saddam Hussein from power." Bush stopped short, however, of admitting error or poor judgment; instead, his administration repeatedly attributed the stark disparity between its prewar public statements and the actual "ground truth" regarding the threat posed by Iraq to poor intelligence from a Who's Who of domestic agencies. On the other hand, a growing number of critics, including a parade of former government officials, have publicly � and in some cases vociferously � accused the president and his inner circle of ignoring or distorting the available intelligence. In the end, these critics say, it was the calculated drumbeat of false information and public pronouncements that ultimately misled the American people and this nation's allies on their way to war. Bush and the top officials of his administration have so far largely avoided the harsh, sustained glare of formal scrutiny about their personal responsibility for the litany of repeated, false statements in the run-up to the war in Iraq. There has been no congressional investigation, for example, into what exactly was going on inside the Bush White House in that period. Congressional oversight has focused almost entirely on the quality of the U.S. government's pre-war intelligence � not the judgment, public statements, or public accountability of its highest officials. And, of course, only four of the officials � Powell, Rice, Rumsfeld, and Wolfowitz � have testified before Congress about Iraq. Short of such review, this project provides a heretofore unavailable framework for examining how the U.S. war in Iraq came to pass. Clearly, it calls into question the repeated assertions of Bush administration officials that they were the unwitting victims of bad intelligence. Above all, the 935 false statements painstakingly presented here finally help to answer two all-too-familiar questions as they apply to Bush and his top advisers: What did they know, and when did they know it?